Our home office has furniture galore. 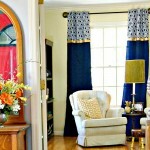 What the room needs now are some interesting and totally inexpensive accessories. 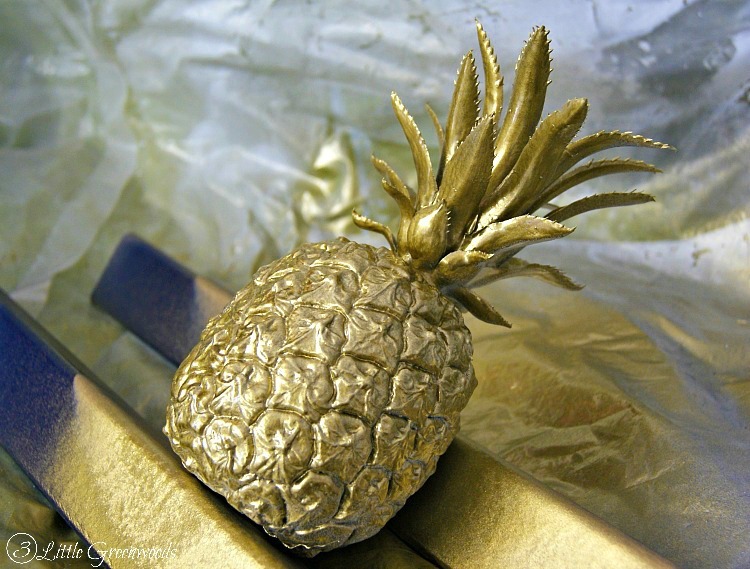 It needs fabulous pieces like this DIY Brass Pineapple. It’s a thrift store upcycle project made from an $.88 piece of plastic fruit and an awesome metallic spray paint. At least one morning a week I stop by the thrift store just to see what inspiration I might find. 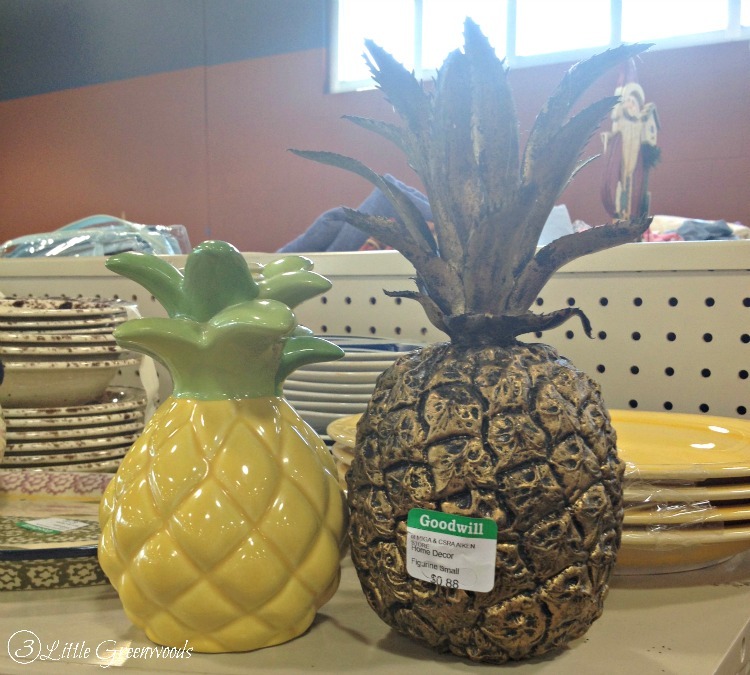 Last summer I discovered these two pineapple beauties. Maybe “beauties” is too nice of a word for a broken soap dispenser and a cheap plastic pineapple from the 1970’s. But spray paint is a bigger miracle worker than my hair dresser so into the buggy they went. I was going through an “all white” phase when I brought them home so the cheapy plastic pineapple got a quick, very uneven coat of white paint. Then I lost interest and banned it to my disaster area of craft room for months. This post contains some affiliate links. Click here for my full disclosure policy. 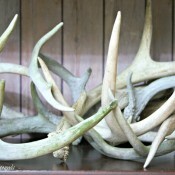 Then our home office update started and the hunt for cool accesories was at the top of the list. 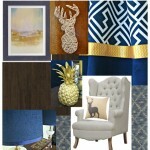 Pineapples are a traditional symbol of Southern Hospitality one in the office would be a perfect fit for the Southern Gentleman theme I’m going for. 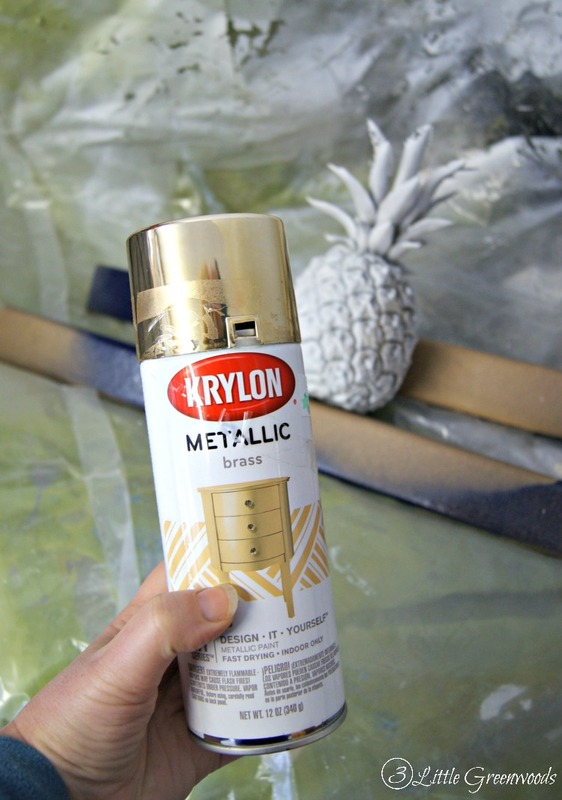 Krylon Brass Metallic spray paint is my new favorite! 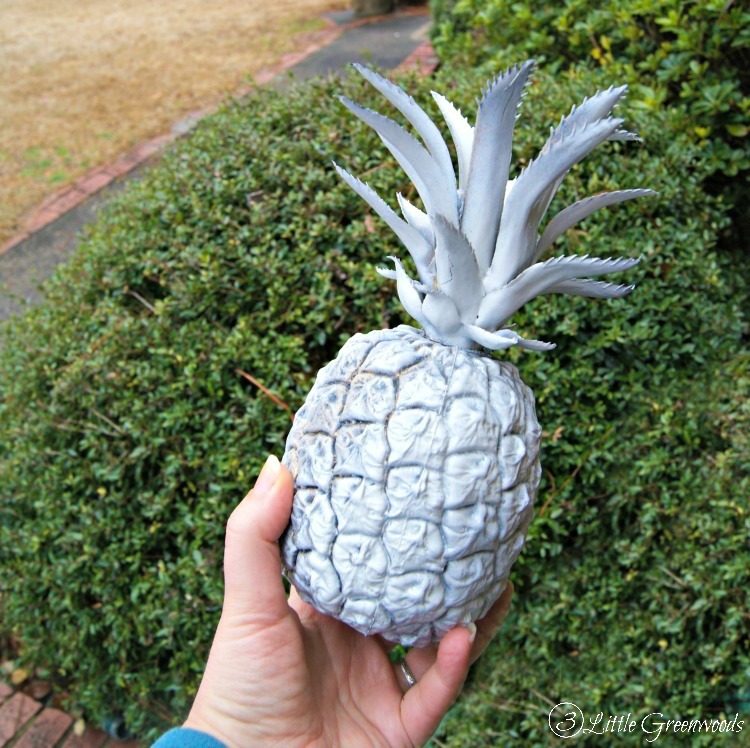 Watch how it takes that tacky plastic pineapple to a whole new level of home decor. See what I mean? Krylon gave me the deep rich brass color I was hoping for. 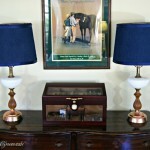 My thrift store upcycle find looks fabulous on our candlestick lamp table! The brass paint adds weight to the piece turning into a designer copy cat for sure. 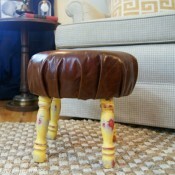 Thrift store upcycling projects like this one make me so happy. 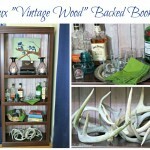 Not only do I get a great piece of home decor to add to my collection but it’s unbelievably inexpensive. 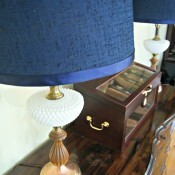 It fits right in with the Hobnail Milk Glass Lamps and Leather Footstool I have already created. 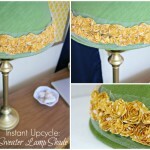 Do you enjoy thrifty upcycling? What’s your latest project? Amazing! I think it looks spectacular! I love this! 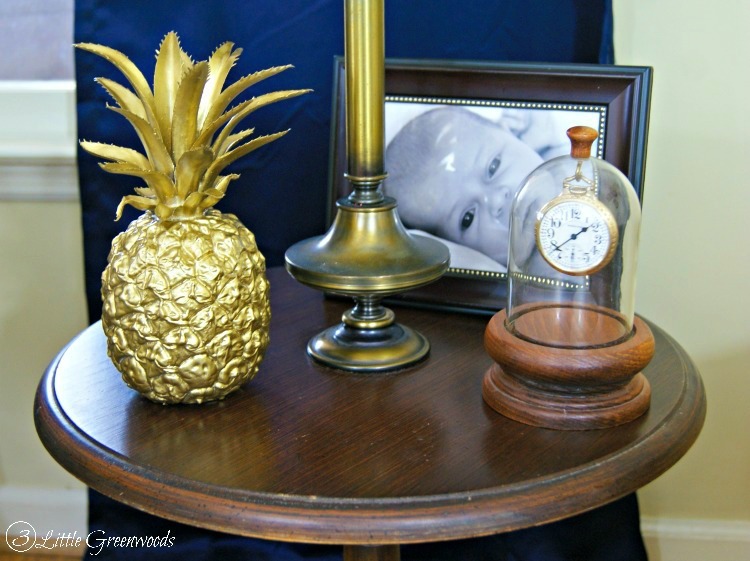 I’ve got several pieces of pineapple decor throughout my house, but I haven’t thought to thrift store shop for them and transform them! 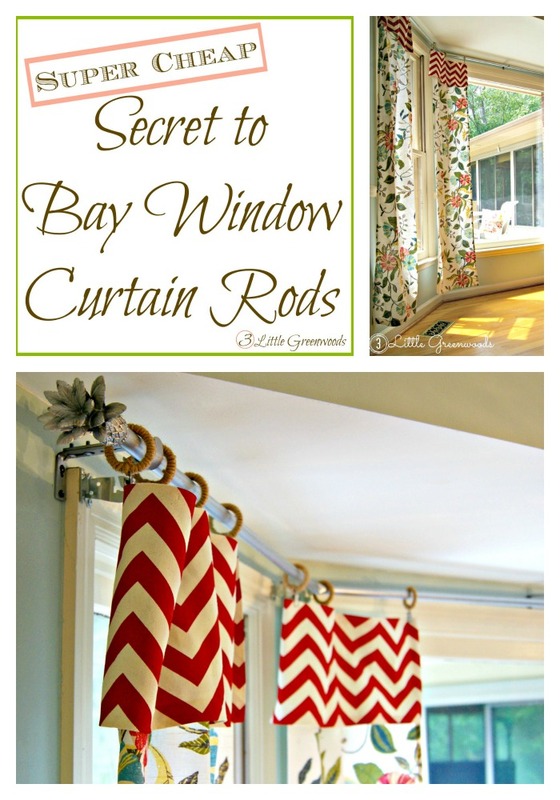 Great inspiration and it looks lovely in your home office. I love how my cheapy plastic pineapple looks now! Brass spray paint is the BOMB! Definitely THE BOMB! 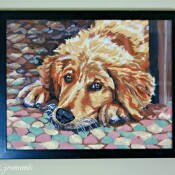 Thanks for linking up at The Creative Circle! I know! I love thrift store shopping. You never know what you are going to find! This is unbelievably adorable! I would’ve spent real money on that in a home store. Now I need to go scavenger through Goodwill! HA! Thanks so much, Allie! That turned out super cute! Love the gold! Thanks for sharing at Motivational Monday. 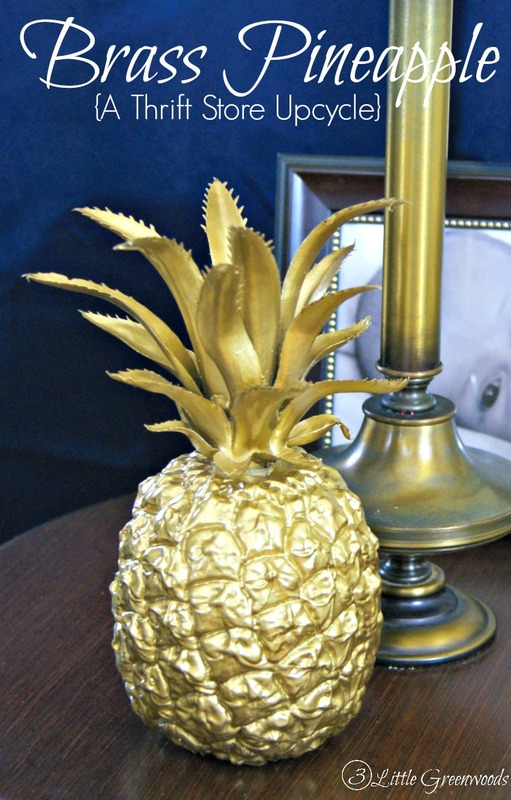 My “brass” pineapple looks so good in our home office! So cool! 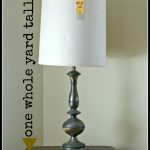 This is such a bold little accessory, and I totally agree with you about spray paint being a miracle worker! 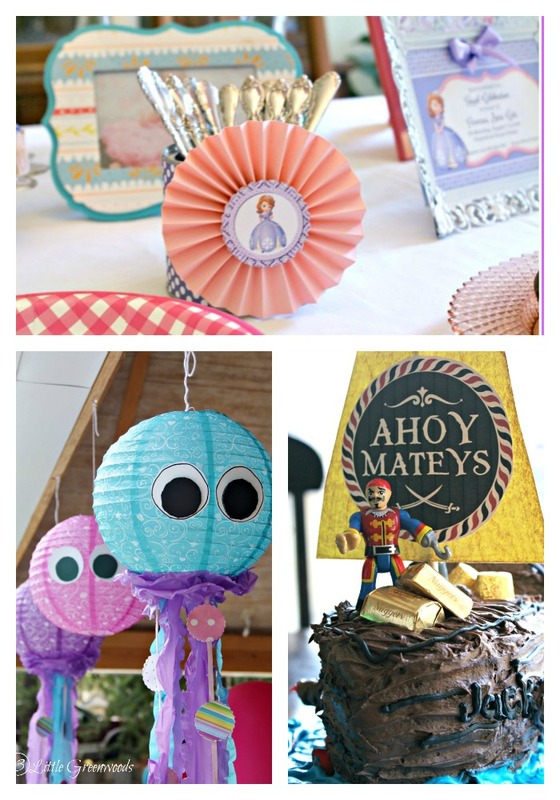 Thanks so much for the great party, Kristina! 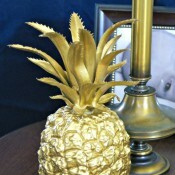 So happy you like my little brass pineapple! Hi, thanks for the great tips. One project that I show off every Easter is the paper mache eggs that my granddaughter and I did many years ago. We used small plastic eggs and glued them shut. I made the paper mache with small strips of newspaper, thin flour and water paste.. Dip paper into paste, wipe off excess and wrap wet paperacross egg. When covered in one layer. Set it to dry till tomorrow. Do about a dozen eggs. Repeat layers again with every egg. Allow to dry one day. Repeat layers for third time, and drying for 1 day again. Paint eggs with bright, colorful, acrylic paint. Do not try to be too precise in painting–just random splotches of irregular shapes of color. Let dry. Spray with clear acrylic. Add glitter to some. Eggs are colorful and keep forever. I put them out in a beautiful basket every year for a centerpiece. 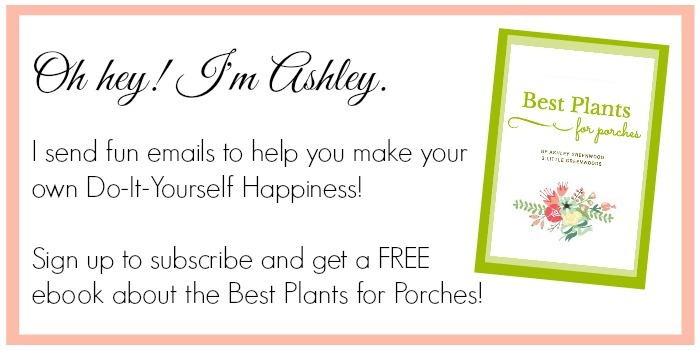 Thanks so much for the fun DIY idea! 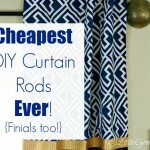 Thanks for all the wonderful ideas, I especially can’t wait to make the curtains this weekend!!! These couldn’t have come @ a better tme, my parents r visiting (yeaaaaaa :):):) )!! Also looking forward to doing some spray painting! Thanks again, u have such great ideas! Awesome! Send me a picture of what you get accomplished! 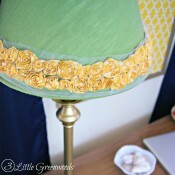 Very cute upcycle! Might try that paint…I’ve been looking for one that actually mimics brass. And that pineapple actually looks real in the photos. What an improvement now with the gold! 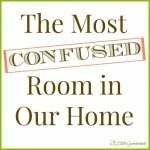 Know you are enjoying it tremendously! YAY! So happy you’ve been inspired. That brass spray paint is fabulous. I’ve used it on several projects and have always been pleased.